Real dairy chocolate and mint choc chip ice creams and chocolate brownie pieces, finished with chocolate and mint sauces and whipped real double cream. Rich chocolate and vanilla ice cream, biscuit, marshmallows and gooey chocolate fudge sauce topped with whipped real double cream. Real dairy chocolate and vanilla ice cream with chopped nuts, fudge pieces and chocolate fudge sauce topped with whipped real double cream. Real dairy strawberry and vanilla ice cream, layered with mini marshmallows and strawberry sauce topped with whipped real double cream. Vanilla ice cream layered with fresh sliced bananas, rich, sweet toffee sauce, finished with whipped real double cream. Strawberry and vanilla ice cream with mini marshmallows, toffee popcorn and popping candy. Strawberry sauce and whipped real double cream. A giant sundae glass filled with chocolate brownie chunks, toffee popcorn, honeycomb pieces and mini marshmallows all sandwiched between rich vanilla and chocolate ice creams with warm chocolate fudge and caramel toffee sauces, topped with whipped real double cream. Three layers of chocolate fudge cake with chocolate icing and white chocolate ganache topped with white and dark chocolate curls. Chocolate ganache and creamy mascarpone cheesecake with chocolate cookie biscuits and creamy vanilla centres. Topped with chocolate cookie biscuit pieces. A creamy cheesecake on a crunch biscuit base rippled with strawberries. Topped with strawberry coulis and crumbled meringue pieces. 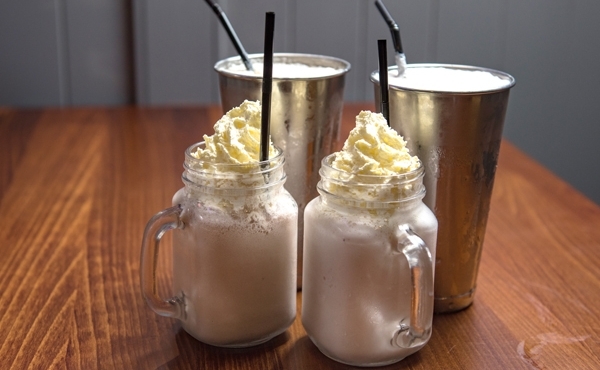 Thick shakes made with ice cream, a variation of spirits and topped with whipped real double cream. See flavours below. Strawberry ice cream, strawberries, lime and gin. Vanilla ice cream, coconut, pineapple and Malibu. Cookies & cream ice cream, coffee liqueur and Bailey’s. Chocolate and honeycomb ice cream and Jack Daniels. Salted caramel & fudge ice cream with a shot of Jagermeister. A chocolate coated waffle with honeycomb and vanilla ice cream, chocolate honeycomb pieces, whipped real double cream, caramel and chocolate sauce. Loaded with sliced banana, salted caramel and vanilla ice cream and whipped real double cream finished with caramel and chocolate sauce. 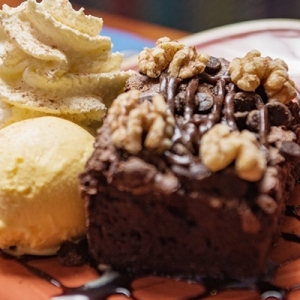 Vanilla and chocolate ice cream with chocolate sauce, whipped real double cream, fudge pieces and chocolate brownie bites. Cookies and cream and vanilla ice cream with chocolate sauce, whipped real double cream, chocolate drops and Oreos. Salted caramel and vanilla ice cream with caramel sauce, whipped real double cream, mini donuts and marshmallows. Strawberry and vanilla ice cream with strawberry sauce, whipped real double cream, marhmallows, sweets and candies. Espresso and hot chocolate with milk.